This product has been replaced by the Dirt Motel 3. Check it out now! More interior space doesn’t have to mean extra bulk. The leading TN3 tent is designed to comfortably accommodate a trio and fold up super compact. Well-engineered and fully featured, it’s part of the high-performing TrailLogic™ Collection. With shorter 14-inch aluminum poles for easier packing, innovate hug-clip technology that simplifies setup, and a fun-to-use nighttime Stargazing Fly™, nothing’s more effortless in the outdoors. Having a convenient tent cube to save space inside your pack adds even greater appeal. Lighten up and find happiness on the trail. This tent is great! I agree with the others that say it could be longer I'm 6'4". My wife and I love the tent and the star gazing option with the fly. However After 2 years and about 15-20 uses the windows on the fly have delaminated. We used gorilla tape as a fix for now but very supprised that that happened. Anyone else have this problem??? This would easily be a 5 star tent if it were not for the rain fly problem. This tent is absolutely great with the ease of setup, ventilation, epic views, and great vestibules on each side of the tent! Make the tent longer or at least offer an option of "Long" like sleeping bags and sleeping pads! Make it longer and i'll buy this tent again! First thing I did was add silicone treatment to the rain fly. I set this tent up in Alaska during early to mid august for 5 days. My wife and I had plenty of room. This is a big tent for single person but not too big. Like a palace for one person but comfortable with two. The floor tub liner could come up a little to help keep water from heavy rain from splashing...rained for 3 days. But the rain fly could also be tied out and up to make more of a eve away from the tent. All in all I loved the dual vestuble. I did check out the free standing feature when I took the tent down I just unhooked the bug netting and floor from everything. Would be nice in a warm climate time of year. If you buy this tent, just set it up first and I would make sure the fly beads water, if not...do what I did and seam seal it and then spray the entire tent with silicone spray. Let set up for 8 to 12 hours warm weather with mild breeze will get it dry faster. I will be taking the wife out in this tent this spring and likely my oldest daughter so I'm sure they will hope the water sealing holds up. 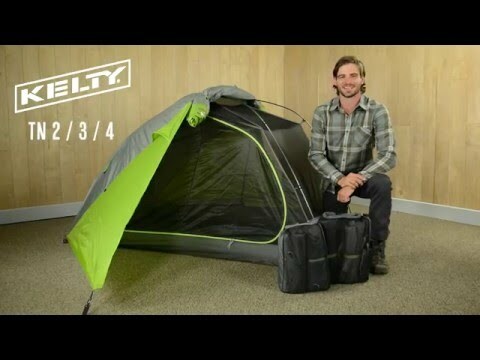 THE tent solution for bikepacking! Apart from the obvious name check and resulting high quality you get with this tent, there is one critically important spec with this tent that no other major manufacturer has appeared to crack. That spec is the 14" packed tent pole. A friend of mine and I took up a 200 mile trek by bike. Part of the experience was camping while on the journey. Space and weight were the major considerations, of course. While other tents may have been lighter, the tent poles never fell below 16". The TN3 had us covered and it was easily packed away in the frame bag. Tent capacities are always kind of a joke and this definitely the case here. I absolutely love this tent but just for 1 person. I'm 6' tall, 210 lbs and there is plenty of room for me and my gear. No gear, maybe a small second person max.